One Mom's Moxie: A Year's Supply of Welch's Giveaway!! It's American Heart Month! FREE 100% Grape Juice for a Year! Sponsored by Welch's and hosted by Mom Does Reviews and her blogger friends. February is American Heart Month. To celebrate, Welch's is offering you great savings, delicious recipes and smart tips that make heart-healthy living easy—and fun—for the whole family. So pour yourself a refreshing, healthy glass of 100% grape juice and dive in! I received a bottle of 100% Grape Juice from Welch's last week. I immediately opened it and poured a glass. What memories it brings back! I remember drinking Welch's as a little girl in Sunday School. We used to have graham crackers and Welch's for a snack. It is sweet and refreshing and has a taste that can't be duplicated! I poured a glass for my son also. He is now a Welch's junkie! He loves it. We usually give him low calorie drinks or water, but Welch's is just too good not to drink! Did you know that a 4-ounce glass of 100% grape juice counts as 1 serving of fruit with no sugar added? More than a decade of research tells us that thanks to the Concord Grape, Welch's 00% grade juice helps support a healthy heart! 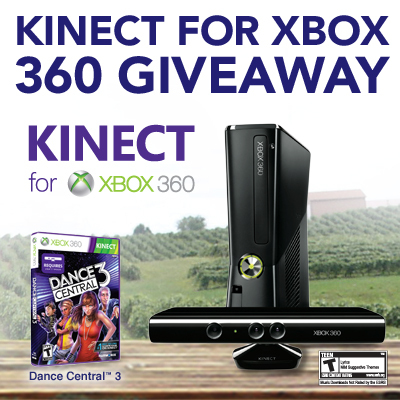 You could win a Kinect for xbox 360! Take a quiz, watch a video and other fun family activities! Welch's is offering one lucky reader a year's supply of Welch's 100% Grape Juice ( 26 coupons for FREE 64 oz bottles)!! Enter on the easy rafflectoper below! MOSTLY B’s: Your family is definitely moving in the right direction. They follow a number of heart-healthy habits—but there’s always room for improvement. For one, we all have hearts, so it’s important for the whole family to eat well. And, a nutritious meal begins with a good plan, which includes making a shopping list that you can stick to. I was all but 1 B's. MOSTLY C’s: You’re one heart-healthy bunch—nice work! Eating a nutritious diet and living an active lifestyle can go a long way to supporting heart health. But remember that while diet and exercise affect your health, so do your genes. That’s why it’s important to understand your family’s heart health history.